We truly believe in using primarily sustainable materials and understanding the environmental impact of each part of the process – from removing the products from the ground, or planting and growing them, to the end of life. We are a small business doing as best as we can and consistently striving to do better. We are always open to your ideas and suggestions (and love seeing new, innovative products!). Our sustainability extends to our packaging which you will see noted in each product description. All packaging is plastic free. We use hemp, the most sustainable material, 100% pure, not blended with cotton. 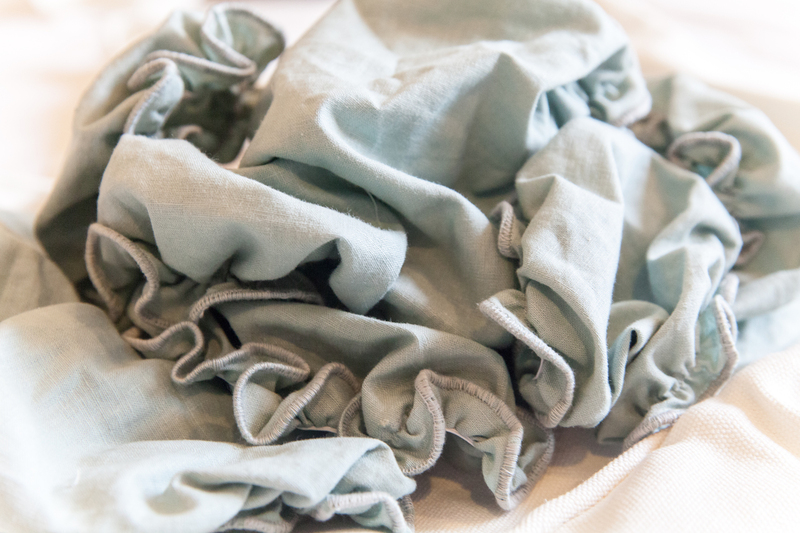 We do not use other virgin materials, recycle cottons & linens and use our scraps. We support the local economy through our sourcing, and doing as much as possible within it. We support other small businesses who provide additional items and collateral. With your help, we’re removing as much plastic from our environment as we can whilst not creating other detrimental impacts. When creating products we consider any mining involved, deforestation, conflict products (such as palm oil), products with sustainability issues (such as soy), shipping, microplastics and more. We limit our impact as much possible and create a positive one where we can. Our hemp comes from a small farm in Thailand next door to Cambodia. We do not blend it with any other materials (other than with pure, panda-free bamboo for a couple of smaller products for softness where noted) as hemp is the most sustainable fabric source. The people in this area of Thailand have been working with hemp for hundreds of years and are able to skillfully weave it without any blending. All of our twine and string bags are also made from 100% pure hemp, whilst our labels are all sewn in from left over hemp material so we reduce any waste created. The downside to pure hemp is that it is extremely expensive. We believe in using truly sustainable sources as much as possible so we have lower profit margins and don’t (read also, can’t!) wholesale our products in order to create with our hemp. 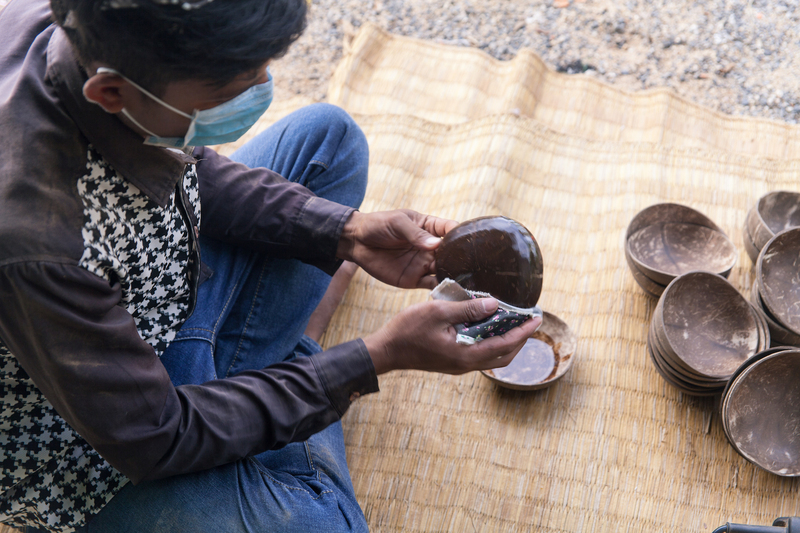 Cambodia produces silk and lotus leaf textiles but has no major fabric manufacturing facilities or cotton mills. It is however a country with a huge garment sector for companies outside of Cambodia. With this comes a lot of excess waste, and deadstock. 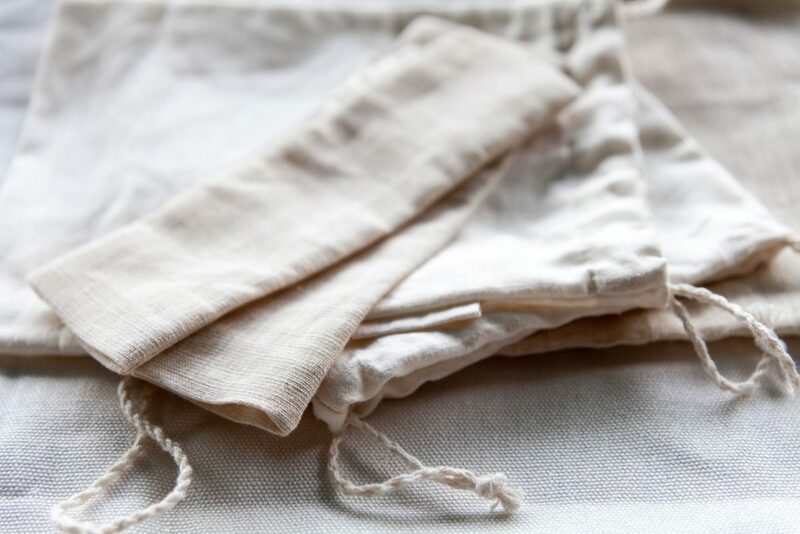 A number of these companies use sustainable materials like linen which is pure or a blend of flax and cotton. We are able to source the fabrics that would have been directed to landfill, or burned, and use them for our own products instead. No shipping required. 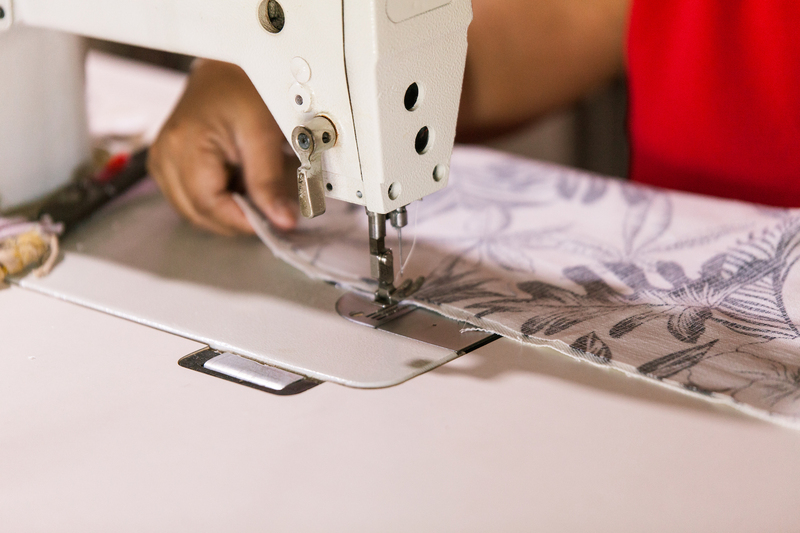 As the materials are off-cuts from big companies, this often means we make limited edition styles but we believe this is the most sustainable way we can create these products (and means we naturally have new styles throughout the year!). 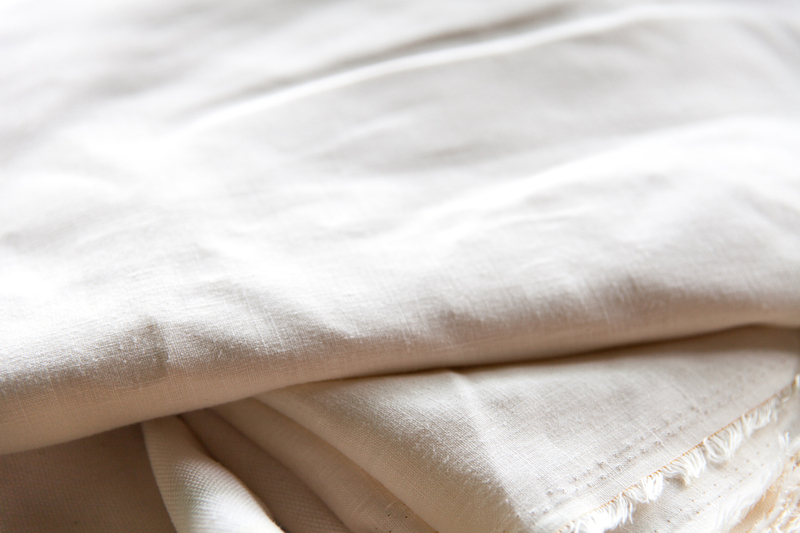 Our recycled cottons are sourced similarly to our linen above but come from both Cambodia and Thailand on our trips. 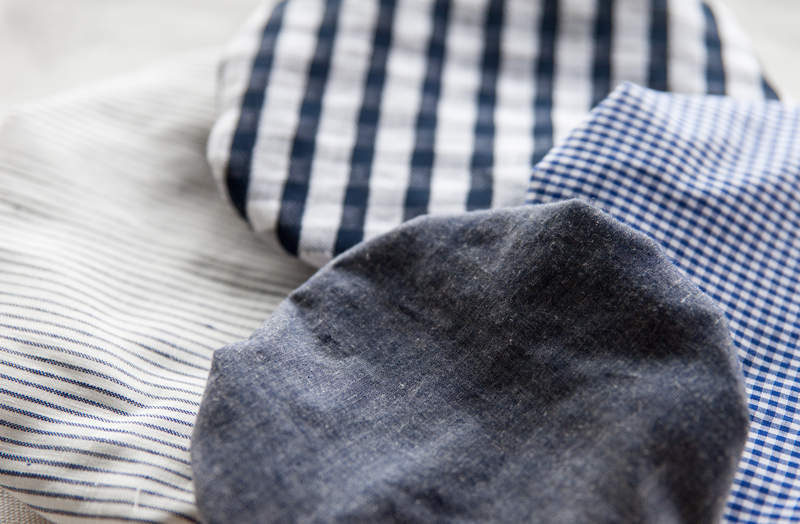 We responsibly source our cotton rather than using new (virgin) cotton which has to be produced. Whether organic or standard, cotton requires an enormous amount of resources to manufacture, so using cotton that already exists and would otherwise end up in landfill is much more effective. 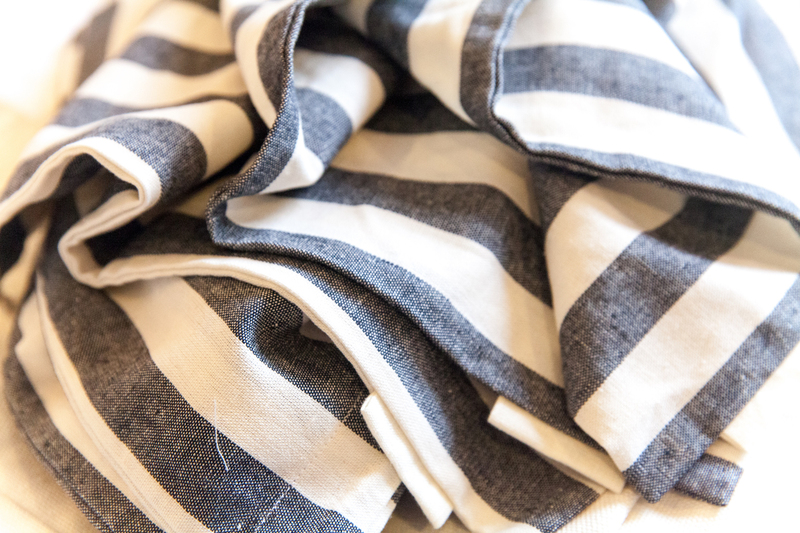 No additional environmental impact occurs for our fabrics to be utilized. Companies often have excess fabric as styles change so quickly, they over-purchase, they received the wrong color variants, there are samples that can be utilized, there is an error in the style we can cut around but they can’t use, or they decide not to use a certain style for a season. The materials are in their original condition and we love scouring around for these and supporting the secondary market in the local economy. We are also happy to partner up with other organizations who have excess of their cottons or linens that we can utilize to reduce waste. If you have at least 5 metres of the style, please reach out. We’re also designers so one day we dream of being able to print our own works onto recycled cottons in a really eco-friendly way but in the mean time we use our design eye to select the best materials around. Why is hemp so much better than new cotton? 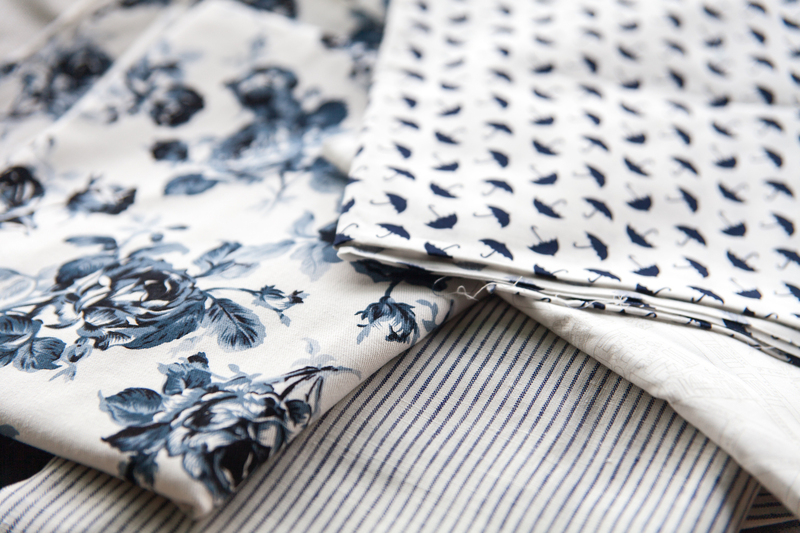 We use good, expensive fabrics and we should be utilizing all of it – so we do! 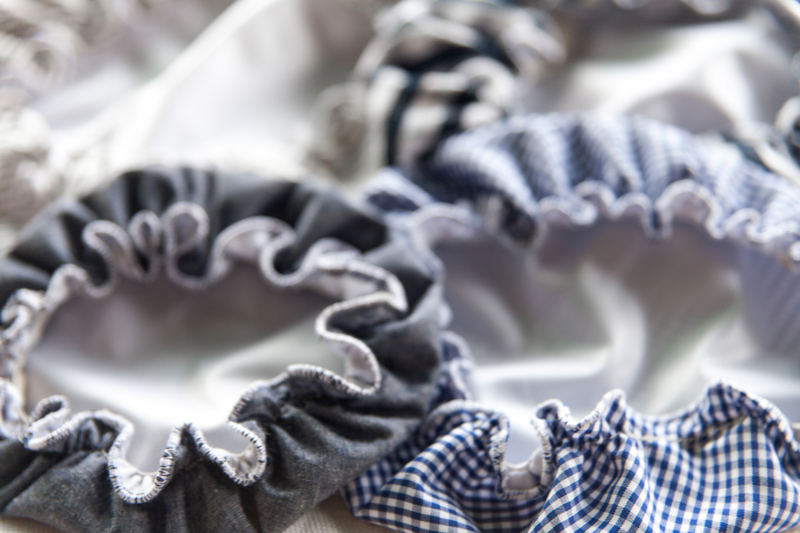 We get our math on and cut our fabrics so we create the least amount of left overs as possible. We also design with this in mind. That’s why we have square face wipes rather than the common circular ones. With certain fabric lengths we have enough left over material to create our mini snack bags (also great for nuts and powders at the bulk store) rather than it going to waste. We turn these into 2 sizes to account for as much of the fabric as we can; and they’re super useful! Our kitchen sponges are made with the rest of our natural scrap material inside (ensuring it’s all compostable) so we effectively have none left. We also collect natural fibre scraps from other local businesses to close their loop too. We’re pretty much waste free in this regard! We use coconuts in three different ways. Firstly, our bowls, no matter the size, are made from the shells of discarded coconuts. Generally these are burned, left along the rivers or dumped. We collect these from around town, families and markets (in which case we provide a small fee which gives value to the secondary waste). 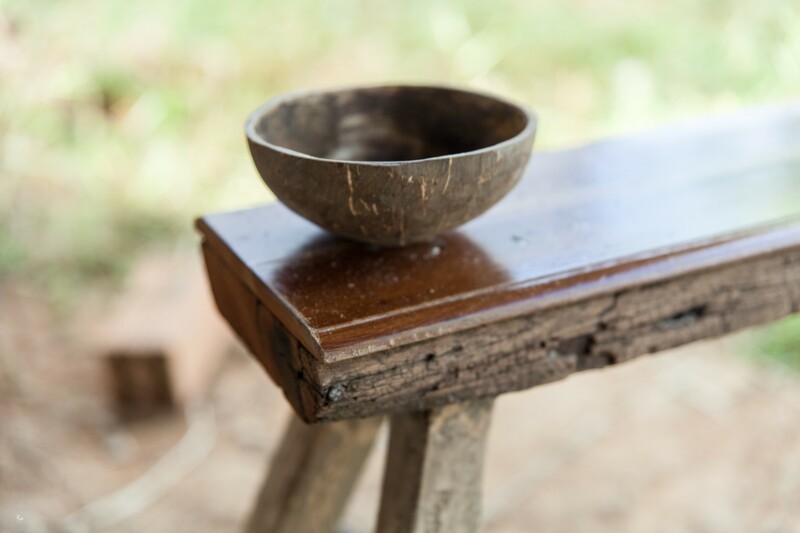 Secondly, our wooden products are made from ethically sourced coconut wood. When new trees are planted to replace old coconut trees which bear fruit for around 60-80 years, the tree often ends up as waste. 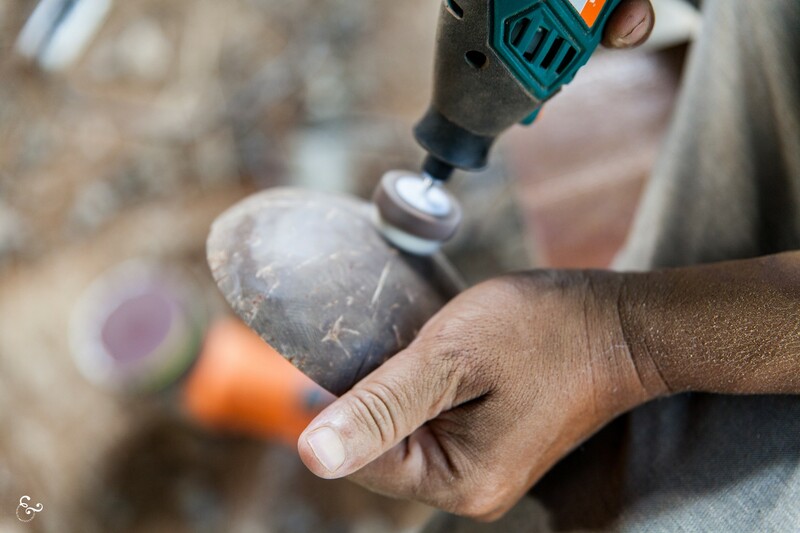 Our team uses this material to hand craft our wooden products making coconut trees a very sustainable source and a consistently closed loop. Local carpenters and wood workers make our custom items at home. The wood is naturally anti-bacterial. Lastly, we make our own coconut oil in our little centre. 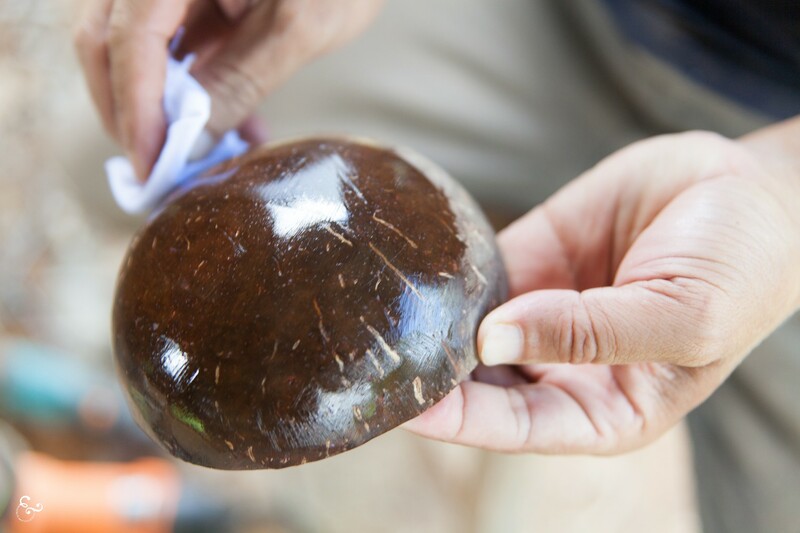 We source local coconuts and use a pressing machine to create the oil which is then used to polish our coconut products. No chemicals, toxins or lacquers are applied to anything we create and everything is kept natural – just like the unique style of the coconut in each product! We strive to make our products as environmentally friendly as possible but sometimes we are limited by technology, laws, excessive costs or access. At times it also has less environmental impact overall to use a non-renewable source (when taking account crude resources, water usage, emissions, shipping, lifetime usage, washing cycles, degradation, packaging etc) whilst better circular options aren’t available. Whilst most of our items are designed to have an end of life as part of their product cycle, some of the components do not and we want to be open about this. We are currently looking at a better alternative for a certified food-safe lining that is water resistant, biodegradable, robust and lasts at least a couple of years. Nobody will use a cover for say their dips that’s difficult to clean, consistently gets into the food and just doesn’t prove useful. Ultimately, that creates more waste. Many options on the market that tote biodegradable properties with water resistance only effectively last 4 – 9 months with semi-regular wash cycles making them have more impact over the course of 5 years as they consistently require new virgin materials to be produced again for repurchase of the items. We are exploring an innovative option with a local company using discarded excess from trees. We are also in contact with two tech companies with options they created that fit most of these requirements and have been thoroughly tested in washing cycles. The biggest issue here is making sure it is food safe certified which limits innovative options. 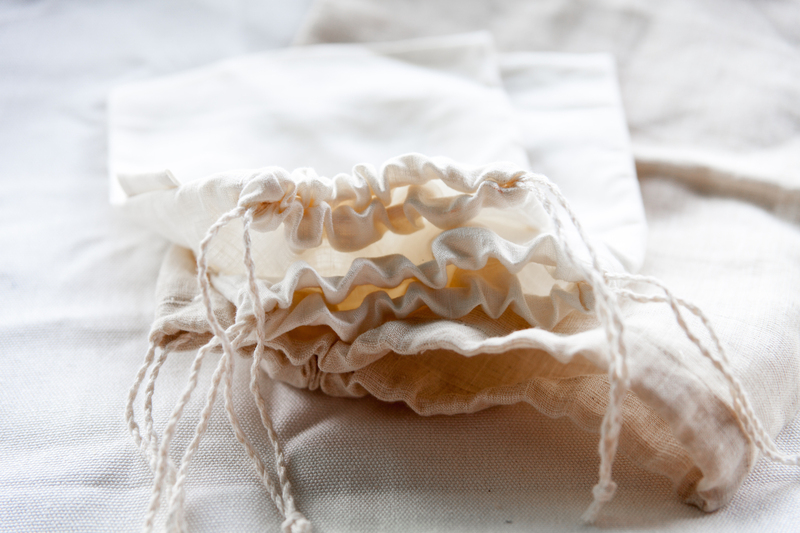 The other items we are currently pursuing are sourcing an eco-friendlier elastic for our bowl covers. We’d also love to find a similar eco-friendlier alternative for the velcro used in our food pouches. 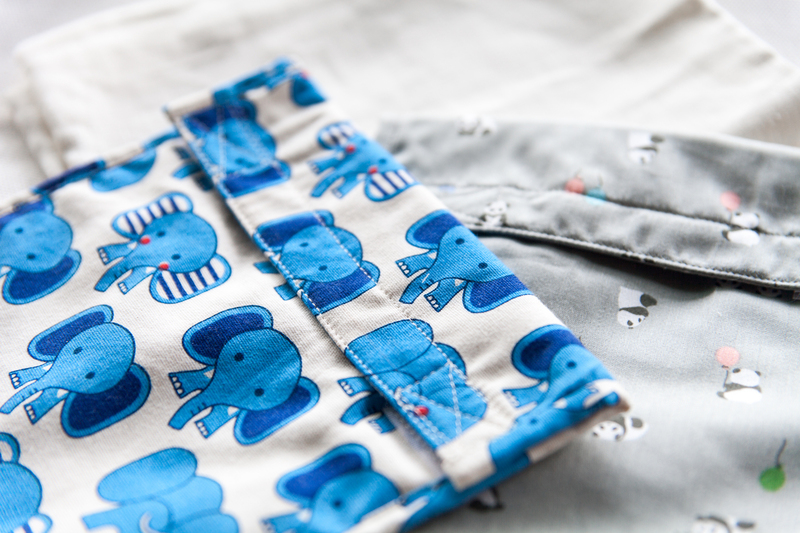 Though we wanted invisible magnets inside our essential carry pouches, these are always supplied in plastic to sew in whereas the standard ones we could source without. We’d love to find an eco-option for invisible magnets to potentially utilize these. Lastly, a truly sustainable zip would be dandy (for our zippered large produce/bread bags as they need to hold in the good like cut fruits). We’re constantly researching and talking to suppliers and developers but if you have a product, or an idea, please reach out!